Following the War, upon recommencement of school in 1945, there were hardly any teaching or study materials available to teachers or pupils. In May of 1945 I had returned to my home town of Wulferstedt in Saxony-Anhalt, an area then occupied by American troops, but which was then subsequently turned over by the Americans to the Soviet occupation troops in June of that same year. When school recommenced, the Soviets forbid the use of any [former] teaching materials other than the basic primer. At that time we were only 5 teaching colleagues at the school and we found it difficult to obtain suitable teaching materials. Taking advantage of my skill in the use of my hands, I and my pupils in the 7th and 8th classes made our own teaching and learning materials for our lessons in local history, geography and natural sciences. The predecessor globe was built in 1946 using a scale of 1 to 30 million and then followed some years later by the above pictured globe built to a scale of 1 to 15 million. 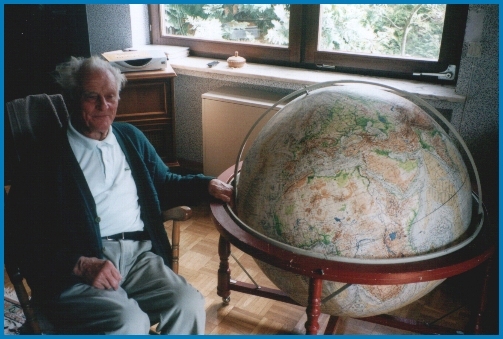 • The construction of the globe was intended to be as light as possible, so I used a 3 mm particle board [viz. pressed wood, chip board, plywood] to make the inner ribs of the globe (this was a rectangular piece of wood 3.5 x 1.25 meters in size) and an 85 cm long and 3 cm wide round piece of wood as the axis of the globe [running from the North Pole to the South Pole]. • Taking this wood I made seven round wooden surfaces (circular levels as cut-outs) using a simple fretsaw. The equatorial level was cut as a round piece of wood having a diameter of 84 cm. At the level of 45° North and 45° South latitude, the circular cut-outs had a diameter of 62 cm. Four circular pieces of a diameter of 12 cm were cut out for the poles, and two pieces were then glued together for each pole to make the poles more stable. • 36 crescent-shaped ribs, 2.5 cm wide in the middle and 1 cm wide at the ends, having a length of 1 m 355 cm, i.e. equivalent to half a circumference. • 36 crescent-shaped ribs, 2.5 cm wide in the middle and 1 cm wide at the ends, having a length of 70 cm. These ribs reached from the circular wood cut-outs at 45° N und 45° S.
• 72 notches of 1.5 cm or 1 cm were made at 5° meridian intervals on the equatorial cut-out and also the circular cutouts at 45° N and 45° S.
• The same was done on the crescent-shaped ribs. • Notches at 10° intervals were made on the circular cut-outs at the poles. • The crescent-shaped ribs were sawed out piece by piece and then mounted on the circular cut-outs at the respective intervals (equator and 45° N und 45° S latitude), with the double-thickness circular cut-outs at the poles set off by 1.5 cm from the actual axis ends at the poles. • To begin with, the globe consists of 6 layers of heavy (watercolor) paper individually measured and cut. Using glue strips 3 cm wide, the paper was glued onto the ribs of the globe at 5° intervals using 72 vertical strips of paper 3.7 cm broad at the equator and growing progressively thinner to a width of near 0 at the poles. • The process of gluing created some indentations on the surface of the globe which were levelled out by the application of plaster of Paris (gypsum). • Subsequently, two additional layers of heavy (watercolor) paper were applied and then topped off by a layer of drawing paper (Bristol board) applied at the same intervals as already described above. • The strips of vertical paper were shortened by 5 cm at the poles because of the unavoidable thickening toward the poles due to the glue. The resulting "empty space" here was then filled out by gluing progressively smaller cut-out circular surfaces to make a round top and bottom at both poles. The globe was mounted at an angle of 22.5° in a revolving (turnable) so-called Cardanic suspension using 2 iron rings set at 90 degrees to each other and 2 cm and 3 cm distant from the respective connections. Such a Cardanic suspension permits the globe to be turned so that any part of the globe can be viewed from any viewing location just by turning the globe, whereas the globe stand itself remains stationary. Once the globe had been mounted in a revolving Cardanic suspension, it was easier to pencil in a grid of the latitudes and longitudes at 5° intervals as well as to mark the Equator, the Tropics of Cancer and Capricorn, and the Polar Circles. Thereafter the outlines of the continents, islands, rivers, seas and oceans and locations were drawn. 1 000 000 inhabitants were represented by a red square and metropolises over 5 000 000 inhabitants were drawn in their natural outlines. Rivers and lakes were also marked using deep blue drawing ink. Remnants of draft pencil-made outlines were erased. Using colors to which we are accustomed to on globes of the world, the lowlands were represented by two shades of green in watercolor: dark green color for areas of land below 100 meters above sea level, light green color for land between 100 m and 200 m above sea level. Higher-level ground between 200 and 500 m above sea level was colored in light ocher. Elevated areas from 500 to 1500 meters above sea level were colored light brown. Mountainous regions above 1500 meters above seal level were colored dark brown. 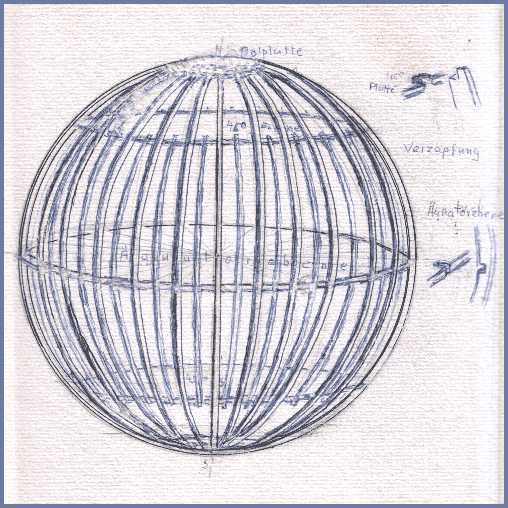 In order to give the globe a three-dimensional effect, a stronger dark brown color was given to the southern side of elevated areas (so-called strong "hatching" in drawing). The regions of ice at the North Pole and South Pole as well as glaciated areas of high mountainous regions were colored blue-white. The oceans and seas were colored in blue colors, very light blue near the coast to a depth of 200 m, bright blue for the continental slopes down to 1000 m, darker blue to 3000 m and very dark blue for depths beyond 3000 meters. Areas which were "hatched" (emphasized) in the drawing of the ocean bottom were thresholds, ditches, depressions and seabed contours. The elevations of noteworthy mountains on the surface and deep seabed depressions are marked in meters on the globe. Larger related areas are colored in watercolors, the mountains and hatchings are done in brown ink, and the script and numbers are done in indelible ink (brand Rotring). Political borders of nation-states are marked by broken lines and names are written in red ink. A total of ca. 5000 names were marked on the globe. 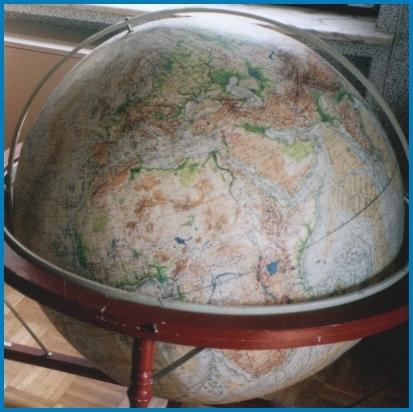 Lastly, a fixative spray was used on the surface of the globe to protect it as far as possible from color fading and damage from other outside sources. 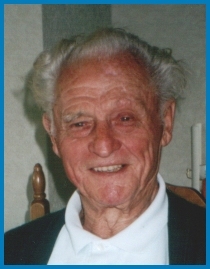 Nach Wiederbeginn der Schularbeit 1945 waren nach dem Krieg kaum Lehr- und Lernmittel vorhanden. Ich war im Mai 1945 in mein Heimatdorf Wulferstedt im Land Sachsen-Anhalt zurückgekehrt, das von amerikanischen Truppen besetzt war, und ab Juni an die sowjetische Besatzungsmacht übergeben wurde. Bei Unterrichtsbeginn verboten die Sowjets sämtliches Lehrmaterial bis auf die Fibel. Wir waren 5 Kollegen und hatten viel Mühe bei der Lehr- und Lernarbeit. Mit den Schülern des 7. und 8. Jahrganges fertigte ich bei meiner Handgeschicklichkeit im Werkunterricht für die Heimat- Erdkunde und Naturlehre Lehrmittel für den Unterricht an - so auch 1946 diesen Globus (nach einem Vorgänger im Maßstab 1:30 Millionen) im Maßstab 1:15 Mill. Das Gerät sollte so leicht wie möglich sein, daher benutzte ich zur Herstellung des Innengerüstes 3 mm starkes Spanplattenholz, (Rechteck 3,50 m zu 1,25 m) und als Achse einen 85 cm langen und 3 cm dicken Rundstab. 2 Breitenkreisflachen (bei je 45°N und 45°S) mit 62 cm Durchmesser. 4 Polkappenkreise - Durchmesser von 12 cm, von denen, je 2 zusammengeklebt wurden. am Ende 1 cm, Länge 1 m 355 cm, gleich einem halben Umfang. 36 Rippen. Abmessung in der Mitte wie oben mit einer Länge von 70 cm. Die letzten reichen nur zu den Kreisplatten bei 45° N und S.
Äquator- und Kreisplatten wurden mit einem Meridianabstand von 5° 72 Einkerbungen von 1,5 cm bzw. 1 cm vorgenommen. Das gleiche bei den sichelförmigen Rippen. Ebenso wurden bei den Polplatten auf 10 Längengradabstand Einkerbungen vorgenommen. Die sichelförmigen Rippen wurden Stück für Stück auseinandergesägt und an den Kreisflächen in entsprechendem Abstand (Äquatormitte, N und S Breitengrad), und die Polplatten im Abstand von 1,5 cm vom Polende an der Achse senkrecht befestigt. Zunächst wurden 6 Schichten aus Karton (mit je Abmessung) je 72 Kugelzweiecken  am Äquator 3,7 cm Breite und zu den Polen bogenförmig aufeinanderzulaufend erstellt und ein Klebestreifen von 3 mm Breite einseitig angebracht. Durch das Verleimen entstanden an der Kugeloberfläche leichte Dellen, die durch Gipsauftragung ausgeglichen wurden. Zum Abschluß wurden noch 2 weitere Kartonschichten und eine Zeichenpapierschicht in gleicher Abmessung aufgeklebt. Die Kugelzweiecke wurden wegen der dicken Leimauftragungen an den Polen um 5 cm gekürzt und der fehlende Raum zur Kugelkappe durch sich verjüngende Kreisplatten ausgefüllt. In 2 rechtwinklig zueinanderstehenden eisernen Kreisbögen von je 2 und 3 cm Kugelabstand wurde die Kugel mit 22,5° Achsneigung eingebaut und kardanisch in einem fahrbaren Gestell (drehbar) untergebracht, so daß durch Drehung der Kugel jeder Kartenteil gut lesbar ist. Orte und Städte wurden in folgender Größenordnung nach ihren Einwohnerzahlen in Tusche, Großstädte mit roter Farbe dargestellt. Kleinere Orte unter 10 000 Einwohnern in kleinen Kreisen, Mittelstädte unter 100 000 Einwohnern mit größerem Kreis, Großstädte über 100 000 Einwohner mit rot gefärbtem Kreis, über 500 000 Einwohnern mit größerem roten Kreis, Millionenstädte im roten Viereck und Riesenstädte über 5 000 000 Einwohnern im natürlichen Umriß eingetragen. Hellgrüne für 100 bis 200 m Höhe. Das Hügelland von 200 bis 500 m Höhe im hellen Farbton (ocker). das Hochgebirge über 1500 m Höhe in dunkelbraunem Farbton aquarelliert. Eisregionen an Nord- und Südpol sowie Teile des Hochgebirges sind in blauweißem Farbtönen. bis 3000 m in tieferen, über 3000 m in dunkelblauem Ton. Besonders Strukturen des Meerbodens wie Schwellen, Gräben, Senken und Seebodenformen wurden durch Schraffen erzielt. Bemerkenswerte Berge und Tiefpunkte in Seegräben sind in Metern in Zahlen angegeben. Größere zusammenhängende Flächen wurden (s.o.) in Aquarell, die Gebirge und Schattierungen durch Braunstift gezeichnet, die Schrift in Tusche (Rotring) ausgeführt. Politische Grenzen der Staaten in gestrichelter Linie, in rot die Namen eingetragen. Im Ganzen wurden auf dem Globus ca. 5000 Namen eingetragen. Durch einen mehrmaligen Fixativanstrich ist die Oberfläche einigermaßen vor Verblassung und vor Stößen geschützt. This page was last updated July 23, 2006.